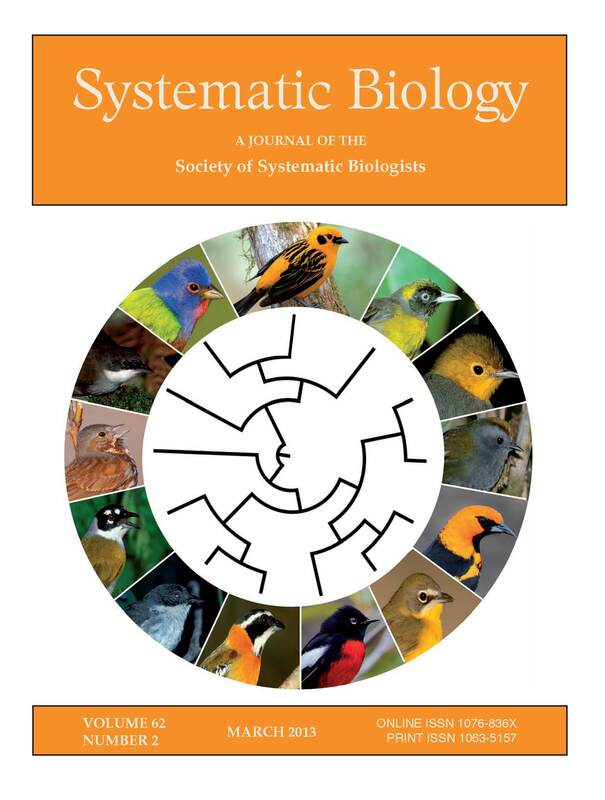 On the cover of this month’s issue of Systematic Biology is an article by Keith Barker, John Klicka, Scott Lanyon, Irby Lovette, and myself on the radiation of New World nine-primaries oscine birds. This group of birds is huge, containing about 8% of all bird species. About half of the birds are tanagers, birds that we have been studying in the Burns lab for years. The other birds in the group are familiar to North American birders and include blackbirds, sparrows, warblers, grosbeaks, and cardinals. The paper represents our first comprehensive look at the phylogeny of these birds, which we have been working on collectively for over 10 years. One of the more interesting findings is that the rate of speciation in tanagers has been significantly higher than that of other groups, with a rate of diversification similar to that of Hawaiian silverswords. Taxonomically, we suggest some major changes at the family level. To preserve the 5 existing, familiar families, we had to add 11 other families. For example, the Yellow-breasted Chat now has its own family as well as some radiations unique to islands in the Caribbean. The cover looks pretty cool, with 13 of the 16 families represented by a photo. If you like this paper, stay tuned as we have several more in the works!